One of the highest priorities when establishing a garden is to create a good composting system. Of course, it’s possible to feed your plants with commercially produced compost and fertilizers but home composting is so easy, cheap and effective that it makes sense to recycle as much as possible back into the soil. However, most home composting systems have a limitation: you can’t put cooked food waste, dairy products, meat and fish into them as they will putrify, producing bad odors and attracting rats and flies. It all adds to the huge quantities of waste food which are sent to landfill by households, millions of tonnes per year. This is where bokashi comes in – it’s an easy way to compost your cooked food waste so it can end up nourishing your garden rather than in landfill. 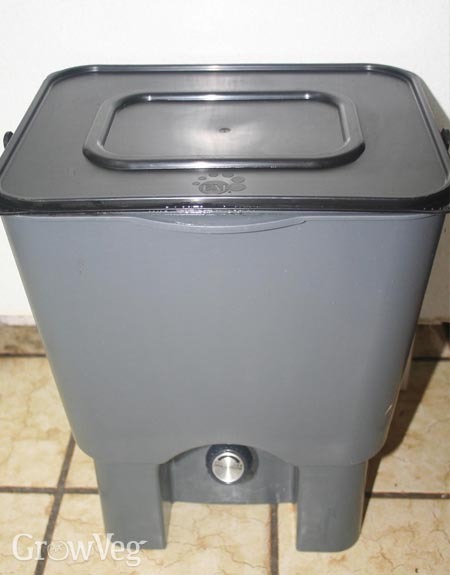 Bokashi is a composting system which originated in Japan and is ideal for use in the home. Unlike traditional composting it relies on adding Effective Microorganisms (EM) which are a mixture of bacteria and yeasts that break down the food using a fermentation process. Also significant is that the bokashi process is anerobic as practically all air is excluded, whereas normal composting needs plenty of air mixed in. In practice this involves having a separate bokashi bin in the kitchen to which food waste is added. To keep the process anerobic it’s best to store up the cooked food waste and add it to the main bin once a week. Bokashi bran is then spread thinly over each 3-4cm (1-1.5in) layer of food to introduce the EM, the mixture is pressed down and then the bin lid is tightly sealed. If the food being added is in large chunks then it needs to be chopped up into pieces so that the EM can get to work on it. This process is repeated until the bin is full, after which it is ready. Depending on the types of foods which have been added to the bin it is quite common to get a colored liquid at the bottom which needs to be drained off every 2-3 days. This ‘bokashi tea’ also contains the EM and has a variety of uses including feeding soil and household cleaning. Although described as a composting method bokashi is really more like a pre-composting process. It starts to break down the food quickly but at the end the mixture still looks vaguely like the food that was put in and is too acidic to use directly on plants. Instead, it is best to either add it to a regular composting bin or to dig a trench about 30cm (1ft) deep and bury it about 2-4 weeks before growing any plants in the area so that normal composting can take place. My family and I are vegan so we don’t have dairy, meat and fish to compost. However, with a toddler in the house we do still have quite a lot of cooked food waste to dispose of so I was keen to try out the bokashi system. I purchased a special bokashi bin which includes a small tap at the bottom to make it easy to drain off the bokashi tea and set up a second small bin to collect the cooked food waste in before adding it to the bokashi one. Adding the food and bran to the bokashi bin was easy and, just as advertised, the EM meant that there were no unpleasant odors, just a slightly sour fermented smell when opened. The smaller bin we were using to collect food before adding it did need cleaning out regularly though. Pretty much anything can be added to the bokashi bin (apart from anything rotting or high in liquid content like soup) but during hot weather the collection bin can start to smell if the ‘only add bokashi material once a week’ rule is adhered to. I soon found that it would be better to have ordered two bokashi bins, since once you have filled one you need to leave it sealed indoors for two weeks (slightly longer in cold weather) before it can be emptied. Having a second bin means you can be filling that while the first one is completing the fermentation process. The bokashi tea that I drained off was a dark red color and can be diluted 1:100 to water into the ground around plants, not directly onto the plants themselves, which I did regularly. The tea needs to be used within 24 hours of draining. I’m not sure how much benefit this made to my soil and it seems that the jury is still out on this one although the manufacturers make bold claims. However, the liquid was particularly good when used in drains. During hot summers we have a problem with a couple of smelly drains and I don’t like adding bleaches which are so bad for the environment. Adding the bokashi tea (undiluted) made a big difference – the EM cleared up the nasty smell within a few days. Once the bokashi process had completed I added it to my regular compost bin. From a second batch I dug the resulting fermented mush into a trench a few weeks before planting peas and beans. It’s difficult to say if the bokashi had much effect – the beans seemed to grow slightly higher where I had added the bokashi material but that could have been natural variation or the influence of other plants. However, having extra material for the compost bin was welcome since I never manage to produce as much new compost as I would like for my garden. The biggest drawback of the bokashi system is without a doubt the expense of having to buy the bokashi bran. It costs about £5 ($8) per 1kg bag, which I found lasted us two bin-fulls, although it’s slightly cheaper if bought in bulk. I estimate the total cost for an average family could be up to £50 ($80) per year which is why it’s advisable to run a standard composting system for uncooked fruit and vegetable waste too. There are alternatives – you can make your own bokashi bran by just buying the EM liquid and mixing it with molasses and wheat or rice bran carefully following the instructions. Various blogs claim to have found ways of producing EM without needing to buy it using everything from fermented rice and milk to various special teas. I have to say I’m a bit sceptical about home-made versions producing the right types of bacteria and yeasts that make bokashi work so well. The big question is whether the expense of the bran justifies the extra compost that is produced. Of course from an environmental standpoint there is no question that it is much better to be recycling more food waste into the garden rather than sending it to landfill. However, for bokashi to catch on, it needs to give economic benefit as well and I think it just about does. The quantities produced are not huge but they are rich in nutrients for plants and with the added benefit of the bokashi tea with all its uses I think this will be one extra composting technique that I’m prepared to invest in. "Another great article, but this is one 'tool' I cannot include in my repertoire of gardening/green credentials. The way I see it is if you have a (fairly large) recurring cost of the bokashi bran then I would rather put that money into a more cost-effective 'tool' for gardening. Once the equipment has been bought then I absolutely need a near-to-zero running cost. After watching many programmes on the foods we all eat, my wife and I discovered we ate far too much meat and now we literally only put on our plates what we need - a small amount of meat with veg - so the issue of leftovers is really quite rare. If we need a snack then we have plenty of bite-size veg to munch on (okay, I confess, we have chocolate sometimes, too!). A friend buries his leftover food one spade deep in his fallow area, apparently to effective use - and I shall be trying this as well next year. For me, my wormery has been the single biggest/best gardening thing I have invested in and the results have been the very best I have ever had. As I say, a great article, but this is my view from the other side of the garden fence, Sorry Jeremy! I'd love to read what others think ;-)"
"Hi Kevin, I totally sympathise with your position. As mentioned in the article my biggest reservation about bokashi is the recurring cost. Ideally local councils would subsidise this, rather than the current situation where the bran is sold at a profit by suppliers. Although wormeries are an excellent addition to any composting system they can't take meat, fish or citrus fruits, so bokashi can be a complement to that. Plus bokashi is ideal in situations like flats where there isn't room for a wormery or traditional compost bin as it can live inside." "Thanks, Jeremy ;-) Yes, I agreed with you in terms of the cost. Where we differed was that I am not prepared to invest in a system that is running at a loss whatever its Green credentials are. I can use that £50/$80 per year to buy in far more compost than a Bokashi can make (3 x 80l bags for £10) which also supports employment (and exploitation) in this difficult economy. By digging in waste food (including meat and citrus etc) most of the benefits of the Bokashi can be realised and the landfill issue is resolved from that standpoint so even flat-owners with access to a garden or large containers can benefit. Also councils are always reluctant to subsidise - heck - where I live they even sell compost bins at a profit! However, wormeries can be as small as a Bokashi bin - I have one and it lives under my kitchen counter-top! So I respectfully re-iterate; I must state the case against investing in loss-making ventures. With all the options available to us as consumers and as gardeners, I think the Bokashi Bin will be a flash-in-the-pan that will be re-assigned as an expensive garden hand-tool box." "Interesting - thanks Kevin. What is really needed is some high-quality research into the effectiveness of the EM 'output' from bokashi on the garden. The manufacturers make bold claims about how it increases soil health by making more nutrients available to plants (beyond what is possible with normal composting) and if true then that would change it from 'running at a loss' to being something worth investing in for the long-term benefit to soil. An alternative I would like to see is councils use food waste to produce bio-gas for heating homes which also uses an anerobic process but with algae (e.g. http://www.guardian.co.uk/environment/2009/nov/22/food-waste-green-biogas-tariff) and perhaps the output could be converted to compost to be given back to gardeners in which case bokashi might be a 'flash in the pan'. Although such ideas are still in their early stages there are tough greenhouse emissions targets coming in many countries that might make money available to councils for just this sort of thing." "I have been making my own Bokashi bran for the last 2 months and its NOT expensive. 1 x 20kilo bag wheat bran 8.50p 1 x 5 litre can Molasses 7.50p 1 x bottle of E.M. 6.50p TOTAL 22.50P I reckon the molasses and E.M. will be sufficient for 40 kilos of bran. So,in effect,this home made Bokashi bran will cost about 80pence per kilo.I am now disposing of the waste from my son in laws restaurant and putting it into my garden.If you wish further details please feel free to contact me and I will help you all I can. I can be reached on rodstafarn@yahoo.co.uk"
"Hi there - I've just bought a bokashi bucket system, having been recommended it by a friend. I have a wormery (they love bokashi compost apparently) and a compost bin, so I'm hoping my waste food will be negligible going forward (I hate throwing food away, even a little bit). Like everyone the cost of the bran is a worry - I like the idea of making my own (would have to be in small amounts) - but the recipes I've found say you have to lay it out and dry it - I just don't have the space for this. So, my question is, can you make a bucket load of it, and use it successfully without having to dry it out? thanks!" "Hya Reen Onion. I make 10 lbs at a time and keep it in the container I make it in. When you make it, press it firmly down in the container.It doesn't have to be made in large quantities and therefore doesn't need drying out as you will use it quickly.Be sure to keep it in an airtight container though.If you want to do away with buying the E.M. use the recipe for making the serum with rice water and milk. It works a treat and will save another 6.50p off the bill. The wheat bran can be purchased from an animal feed dealer as can the molasses. Keep the bran in a bin, or large airtight bucket, and use it as and when in the smaller quantities.If you have a friend thats interested, then the bill for the bran etc can be shared. Buckets with lids, 15 or 20 litres, can be bought cheaply off EBAY. You can use these to mix and store your Bokashi bran. I have used the same buckets to store the waste food mix which has saved me buying the expensive Bokashi buckets you see around.It takes my household 2 weeks to fill a 20 litre bucket, to give you some idea. Only 2 of us in the family and we don't get much liquid.Give me a call if you need any further info. Rod"
"Jeremy.You need to add the waste to the Bokashi bucket once a day and not once a week as you have stated above. Adding waste once a day reduces the risk of the food rotting before you place it in the Bokashi bin and will eliminate the smell coming from the small bin. With regards to cost, I have found that it is costing me less than 40pence a week to treat the waste that I produce in half filling a 20 litre bucket.I personally think that that is as cost effective as you are going to get using wheat bran.Another method of storing the microorganisms is using newspaper instead of bran.I am about to try this method out and I will keep you informed of the result. If it works, then, in my case, I will only be spending about 26 pence per week.Now that has got to be worth a try. Rod"
"Very interesting information Rod, thanks. The manufacturers all say to only add material once a week but if you have it working with more regular additions then it must be fine. Please do update us on the newspaper option." "From my efforts in my wormeries, shredded newspaper makes a good bacterial home. However, you need to have the 'something' there that has the bacteria in the first place, i.e. rotting food. It is the bacteria that breaks the food down into compost. If this works, this would be good, but my present eating habits means I simply wouldn't have enough to put in a Bokashi bin! I look forward to seeing Rod's results!" "Hya Kevin. The micro organisms in the E.M. feed off the molasses. The bran, or newspaper, is only there to give surface area for the bugs to cling to. The system works without air(anaerobic) as opposed to your wormery which needs air to assist the rotting process. (aerobic) If the newspaper experiment works then the cost for me per week will only be about 14 pence as I now make my own E.M. serum from rice water and milk.This newspaper bokashi will then be cheap enough for those who only have small amounts of waste, such as yourself." "Thanks Rod - very useful answer. I've a friend who is using Bokashi, and will probably be interested in making it so we can share the cost and work (and she has more storage space than me, so that might be useful!)." "If one has a worm based composting system, then Bokasi composting appears to offer a small percentage increase in total achievable composting volume. Also councils will now take raw meat and fish etc. as green waste, so it is being composted anyway. Bokasi method may be suitable if one does not have space for the larger worm based composting system "
"Hya Nigel. When using the Bokashi system, volume of waste isn't lost. The waste is exactly the the same as when you placed it in the bin. I appreciate that Councils now take meat waste, etc, but I would rather have the compost in my garden, plus the fact the Bokashi system does not produce greenhouse gasses as normal composting does. Since my last comments, I have been using the Bokashi system to compost the waste from my son in law's pub/restaurant with good results. I recently dug into a piece of the garden which had Bokashi waste put into it in November. I was amazed at the number of worms wriggling around in the rich earth where the compost had been. I have produced about 25x20litre buckets of Bokashi from my original 10lbs of bran, which I consider to be well worth the cost. I reckon that that would equate to about 1 years worth of waste coming from my home. (2pers) I have been using my wormery since July of last year and now have 3 bins operating. I find them very slow in producing compost of any usable amount and I don't get much tea out of them. If you compare the 2 systems then the Bokashi system certainly produces the most compost, using ALL types of food waste and at a fraction of the cost of the wormeries on sale. (Mind you. I did make my own wormery and only use 20 ltr buckets for my Bokashi at nominal cost.) And it does it faster. (2 weeks from sealing the bin after final waste added to fill bin.) Knowing what I know now, and in my circumstances,( wishing to use the compost for my garden,) then I would choose Bokashi as the most efficient and cost effective way of disposing of food waste. Hope the information of of help. " "Hi, I only use my bokashi bins for about 6 mths of the year as I find it very difficult to get rid of the "pickled" waste afterwards. I do not have enough garden to be able to dig it in to the ground (Just a small yard filled with shrubs and plants )and my worms (in the wormery) do not seem to like it, so I end up having to put it into a large tub with some soil in the bottom and another 6 ins on top and keep layering it up this way. I don't have another compost bin as the garden is too small and my garden waste gets taken away by the council. I might just give up this year - it just seems too much hassle. Anyone got any ideas to help me?" "Jackie - a quick thought - how about washing the pickle off and then feeding it to the worms or compost? " "Sorry - I think I might have caused some confusion. By "pickled" I meant the effect the Bokashi bran has on the waste. I used a term that I saw on the site that I bought the composters from. They suggest that the action is similar to pickling in that the waste does not break down until it is exposed to air and then it rots quickly in the ground.I think the problem is that the worms (my boys as I call them) don't like too much in one go - i.e. they need little and often. Maybe that is the answer - not to leave the bin until the second one is full up (as I have been doing) but to take a small amount out regularly and feed it to them and hope that I have emptied it before the second one is full again!" "jackie, i've been researching both bokashi and vermicomposting a lot and here are some of the thoughts i've had about this. first of all, we know that freezing scraps and thawing accelerates the rotting process before feeding them to the worms. so why not - instead of layering scraps in the bokashi bucket immediately - first collect scraps, a worm dinner sized amount, into a plastic bag and keep them frozen, *then* allowing the contents of the bag to thaw and transferring them into a bokashi bucket, layering it in with the bokashi bran, and letting the full volume pickle all at once for two weeks. if you alternate with two buckets that's a worm dinner once a week..? seperately, i've heard some people say their worms love the bokashi scraps, while others say their worms didn't like them so much, while others say the worms had to acclimate themselves...?? i'm left wondering about the variables here and what the truth is. it is known that the bokashi scraps are slightly acidic. the acidity probably increases the longer the scraps are allowed to pickle.. another way i would try to offset the acidity might be to mix pulverized egg shells (i eat lots of eggs and use a cheap coffee grinder after the shells are dried) and or to mix a little agricultural lime/calcium carbonate into the mix when you add the bokashi scraps into your worm farm. the freezing and thawing will certainly accelerate the process and the calcium carbonate from the pulverized egg shells or lime will fix the acidity problem if that's what the worms don't like. what do you think? (p.s. never use quick lime, calcium oxide (CaO), which is highly corrosive with a pH of 14, nor the milder, but still highly alkaline calcium hydroxide Ca(OH)2 - known as builders (slaked) lime)"
"Thank You Jonathan, the freezing is an interesting idea - best make sure I label it up properly otherwise we might have an interesting dinner one night! The calcium carbonate I will definately try and also I must admit to having put egg shells in without drying and breaking them up first, so that's another thing I will do." "If the bokashi tea contains the EM organisms, why couldn't you use tea as a 'starter' for a new lot of bokashi (tea, molasses, wheat bran)? Bacteria multiply like -- well, like bacteria! -- once they have something to eat. If the tea doesn't contain 'bad' bacteria, I can't see why it couldn't be a 'starter' for more bokashi. Or else, a few spoonfuls of previous fermented stuff soaked in water and the solids drained off. (You make bread with a starter, and that's just fermentation -- why not bokashi?) Has anyone tried this? Is there some reason why it wouldn't work? Advice appreciated. " "Interesting question... I've read about several people's experiments with making their own bokashi bran (e.g. http://diggingdogfarm.com/?p=15 and mentioned by Rod Evans above) but not heard of anyone using the bokashi 'tea' as the base for another bran. I think you would probably have to at least follow the steps for soaking brand or newspaper in the tea and perhaps allowing it to ferment further. Anyone else have experience with this...?" "I hadn't heard of bokashi until this morning, but have been using a similar system with finished or rejected mushroom substrate (just the substrate that has white mycelia, it is free, as it is acidic, I use it direct to top dress conifers !) from a local farm ~ layering organic material and substrate (10 in household). No smell, whole lot goes in the compost heap when the bin is full. Note - experiments have shown that bran is full of nutrients and, even untreated, makes good soil amendment. Bran is the covering of certain seeds, part of it's job is to allow germination at the correct moment, which is often when Plant Growth Promoting Rhizobacteria colonise the seed-coat." "I have made my own bokashi for years and find it very inexpensive. Even when I make a tiny batch from a supermarket box of wheat bran I think my total cost still ends up being maybe $2 per month when used in my bin. Also, I have bins that are simply a plastic bucket with lid and they work fine. When I want to collect the juice for the garden I use a bin with a spigot on it. I have made my own spigotted bin, but the store bought one drains better and is still going after 4 years. Here is a good article as to the real reasons gardeners need to bokashi http://www.thegreenbuffalo.com/bokashi-composting.php"
"No one told me about the maggots that come along with the Bokashi ..... : /"
"There should definitely not be maggots. If you are putting meat,in the bin you should make sure you have good fermentation going - by having plenty of tea coming out or seeing some white mold in the bin if you don't have a spigot to get tea from. The people at thegreenbuffalo.com suggest starting out with some sugary carbs at the bottom of the bin- bread, potatoes, rice, fruit etc to kick start it. You might want to cut the meat into small,pieces before adding too. Also, from a couple of posts above, the tea is not the some thing as bacterial culture that creates it . It may have some of those microbes but it also has fertilizer value somewhat similar to worm castings "
"Cool, thanks, think I'll bury this batch and just start over with carbs. I don't compost meat or dairy at all because of lurking rat eyes in dark corners, but yes, I think I haven't been using the tea enough - seems it's been too wet. Phew. Maggots don't make for cuddly house pets." "I separate my waste and compose vegetable based material and bokashi the rest. It works well. This system was designed in japan for apartment dweller sight limited space and it would work well for londoners and everyone in a similar position. I've lived it and it works well. Btw, I've never had a maggot problem, that's about keeping flies out, closed containers at all times and good management. simple stuff actually." "Apologies for spelling - iPhone has replaced the obvious meaning in places. A "
"I noticed from reading this bokashi thread and others on the Internet that people seem to be using much more bokashi powder than I do, and then complain about the cost of powder. You don't need to put much on when you have good fermentation going as evidenced by white mold or plenty of juice being made. I lightly dust with a tablespoon or so if I add an inch to my bin. Maybe 2 tablespoons if I add two inches. I usually fill my bin from my collection container every couple of days. Perhaps some people are adding waste and therefore adding powder too, way to often. This constant opening and closing of the bin is also not very good for fermentation. P.S. I also make my own bokashi powder inexpensively like I mentioned in a previous post. I don't use the EM 1 brand. I use the SCD Mother Culture from The Green Buffalo "
"Hello have been reading all your comments with interest as we are new to Bokashi. Our question was can a new bin be innoculated with an old bins contents to act as a type of starter - much like in making sour dough? As it is very cold at the moment I am using our first bin of fermented waste (no meat or fish) in 2/3 of spent compost and keeping inside to help keep warm. Are there any other comments on the amount of bokashi to use? We were told to use a good handful at each introduction of waste (a large plastic pot added every 2 or so days) to a 15 litre bucket. If the speed of the composting is increased this is good news for a backyward veg grower like myself." "I did the soil factory method in a storage tub in my shed, but didn't have a lid on it. Maggot city. I think the best way to utilize bokashi is to keep it as your indoor composting method, and then add it to an outdoor "Dalek" style composting bin along with your lawn clippings and other garden waste." "Bokashi is measurably better than traditional composting because it preserves pretty much all of the energy and nutrients in organic material, and emits pretty much no greenhouse gas. The energy and nutrients bit is really significant and applies whether or not you believe or care about climate change. The size and diversity of your soil's ecosystem depends on the balance of energy and nutrients input to it. Basic science, which you can look up. Traditional aerobic composting emits heat energy: lots of it. Traditional anaerobic composting emits chemical energy in the form of methane gas: lots of it. Bokashi pickling emits virtually no energy (feel the bin) and virtually no gas (look at the sealed bin: it doesn't swell, or smell). Hence with bokashi, virtually all of the energy and material in the organics reaches the soil's ecosystem. Traditional composting of either kind, as done in gardens, leaches lots of nutrients onto uncultivated ground. Bokashi leaches a very small amount of liquid, which you are recommended to dilute and feed to plants, otherwise nothing. Hence with bokashi, all nutrients reach the soil. The carbon dioxide from aerobic composting and the methane from anaerobic composting are both greenhouse gases, the latter 25 times more potent than the former. Bokashi emits virtually no greenhouse gases. From these viewpoints there's no contest. Added to which, bokashi is less effort, its bins are a lot less smelly and slimy, and it reduces the cost of waste disposal (in the UK by about £25 per average household per year). The best strategy is to learn to do it brilliantly." "I am about to buy bokashi bins, mostly because I understand the rat in my compost bins will hate it and go somewhere else (probably in the wood shed!! ), but I'm not sure what I can put in it. As well as cooked food can I put in things like peelings and veg which is no longer nice to eat, etc. In other words, items that I put on the compost at present. Any advice would be gratefully received." "Terry, you are very likely to get a sheet of advice with the bin. If not you have a strange supplier, and as an alternative I'd suggest a Canadian website called "Bokashi Living". Their FAQs cover virtually everything and are obviously based on deep experience, unlike most web content on bokashi. I include everything except (a) liquids untless I have stale bread to soak them up; (b) uncrushed bones; (c) anything already growing green or black mould, which will compete hard against bokashi's white mould; (d) spent tea leaves (NOT in a bag), which are already fermented and so are good for feeding the soil ecosystem around individual plants. "